Cycling tours are a great way to explore Laois and the surrounding counties. The tours are suited to both experienced cyclists who wish to cycle 25-100 miles a day and to the cycling rambler who prefers a local ride. 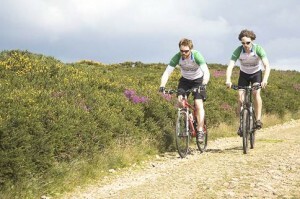 The local Portlaoise cycling club has established several cycling routes to suit all levels. Using expertise and local contacts, the Forum can build a tour to suit your specific requirements taking in historic sites, gardens, historic houses or mountain views etc. You can use the route network to plan your day-by-day itinerary and we are always happy to advise and help with this. We can provide regional handbooks with details of other recommended accommodations, bike rental outlets, luggage transfer agents and airport transfer agents. Having decided upon your travel dates, you can then make the necessary reservations and arrangements. Some of the larger towns offer the full range of accommodation from hostels to luxury five star hotels – other smaller towns and villages are often more limited in their options. As we are centrally located in Laois, using the Forum as a base for your cycling tour removes the hassle of carrying your baggage with you everywhere and will enable you to settle and relax in the evening and maybe visit some local attractions such as the Mountmellick Lace Museum, Tullamore Dew distillery and/or the Kilbeggan Distillery etc. Dublin is within easy reach either by train or bus where you can visit many other famous sites walking distance from Dublin Euston Station, such as the Guinness Hop House, Kilmainham gaol, National History Museum or just walk around the historic streets.